We are glad to announce that the conference will be different this year. CAH-2019 will be held under the patronage of Minister of Higher Education and Scientific Research, The Supreme Council of Antiquities, and Benha University. The 3rd International conference on the Conservation of Architectural Heritage in Egypt has been successfully held in Aswan: one of the most significant historical cities existing today. This conference witnessed the attendance of planners, environmentalists, archeologists, architects, engineers, tourists, policy makers and stakeholders who Conservation of Architectural Heritage. Having been filled with diverse participants from diversified fields, approximately 80 full paper submissions were received and 50 of them presented over several sessions. Authors attending came from different backgrounds and cultures to discuss research on the conservation of archaeological, architectural and urban landscapes, and multi-disciplinary research on complex Cultural Heritage sites. Held on a Nile Cruise that Sailed from Aswan to Luxor, the conference was attended by authors from Australia, Kuwait, Lebanon, Saudia Arabia, Greece, Egypt and more. With Professor Douglas C. Comer, an Archaeologist and the co-President of the United States Committee for ICOMOS (US/ICOMOS), as the Chairperson of the conference, promising conclusions have been reached and recommendations made. Looking to help universities, researchers, professionals, and policy makers to get together to discuss the most pressing issues and develop discussions into actions, IEREK is happy to invite interested participants to attend the third version of 2019. 1. Incorporate Management Techniques and Decision Making in Historic Planning, Management and Development of Historic Areas. 2. Cultural and Religious Identities and their Manifestation of Heritage. 3. Awareness of Heritage Rehabilitation Projects. 4. Innovative Adaptive Reuse and Rehabilitation of Historic Areas. 5. Heritage Planning Policy, Design Guidelines, and Community Development. 6. Integrating Sensitive Additions and Adaptations to the Fabric of Heritage Places Environment. 7. Institutional Role and Modern Techniques in Conserving a Historic Environment. 8. Legislative Tools and Policies for Cultural Heritage Protection. 9. Best Practices in an Assessment, Designating and Managing World Heritage. 10. Economics of Conservation and Sustainable Environment. 11. 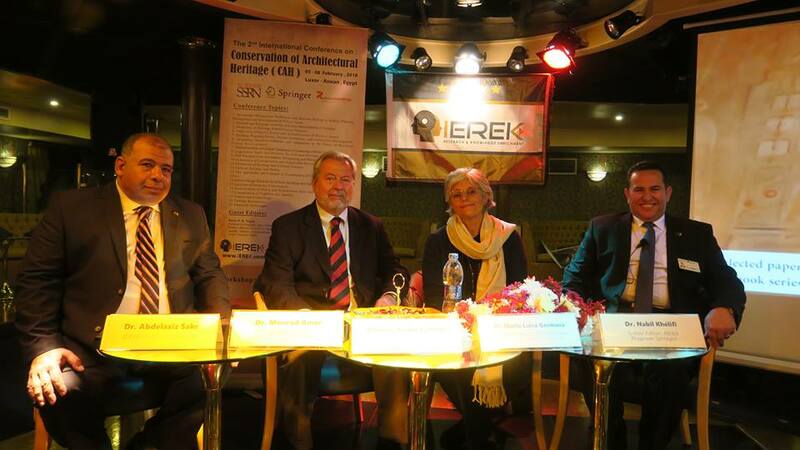 Promotion of Heritage and Cultural Tourism. 12. Cultural Heritage and Media. 13. New approaches and Concepts in Conservation of Cultural Heritage in Historic Cities. 14. Interior Design Solutions for Historic Buildings and Authenticity of the Place. 16. Resettlement of Nubia and Rehabilitate their culture identity. 17. Conservation of Tradition and Identity. – IEREK is happy to invite students everywhere to register for and attend as an Audience in the Conservation of Architectural Heritage Conference For FREE (accommodation fees are not included) only until the 30th of November, 2017. This is an opportunity to learn from and enjoy the conference through the process of learning new experiences, and knowledge. – This is your chance to not only get to see some of the world’s and Egypt’s most famous antiquities and archaeological sites but also to meet respectable and famous academics in their fields. Kindly note that this offer does not include accommodation. – Delegates who cancel their registration due to special circumstances than 60 days before the start of the conference and do not have a paper published in the proceedings will receive a complete refund minus the list price of the conference book and a $100 administration charge. Fees remain payable in full for cancellations received within 60 days of the start of the conference. – Please notice that we will endeavor to assist you in obtaining a visa but the responsibility is yours and the decision rests solely with the appropriate Embassy. Publication in IEREK Press:- Authors will be given the chances to publish in Resourceedings. Selected Manuscripts:- A book Series by 'Springer'. Publication in the 'Springer' Book Series will only be applicable to the selected papers that will be supervised by highly professional members of an International Editorial Board to ensure a high-quality publication material. Thus, such outstanding material will lead to the indexing of the series in well-known indexing databases such as 'Scopus' and 'Thomson Reuters'. *Full length papers are subject to submission into a rigorous revision process by a scientific committee of experts before notice of acceptance/rejection for publication. · Accepted as is for publication (with minor editing changes). The criteria for accepting abstracts for the conference are as follows; a relevant topic of the conference should be proposed with clear writing, aims, and objectives of the study clearly presented as well as a sound literature and methodology of work. Authors will receive a notification message to know the feedback of the reviewers committee. If an author receives the acceptance of his or her abstract, he or she has to continue writing the full-length paper using the requested templates. (2) Is the writing and structure clear? (7) Has the author used appropriate methodology and explained them clearly? After you have received the acceptance of your abstract, please continue to write your full paper with the requested template (please download from the link provided below). English will be the official language of the Conservation of Architectural Heritage (CAH) – 2nd Edition. Attending conferences is very beneficial on the professional level Conferences are full of people promoting new ideas which will expand your knowledge and undoubtedly help your career. You not only get to hear presentations but also converse with other researchers from different universities and even countries you may have only heard or read about.You learn from experts in the field. It is a great opportunity to find more about your field and listen to ideas that could help inspire research ideas of your own. Not to mention, you will get an overview of the place or city where the conference is being held and learn about its people and culture. It is an opportunity to engage with respectable professors and discuss with them the very latest research projects they could be working on. For participants who need Entry Visas, IEREK will issue a visa letter for applicants who are accepted to present at our conferences. The conference will be held in the River Nile cruiser "Grand Princess" from Luxor to Aswan. A nonstop 4 days cruise will cover the most important heritage and cultural sites in the world. All of the visits to the spots and sites include free pickups and drop offs from and to the cruise boat. Spending your time in Egypt in the river cruise will let you enjoy seeing the most exciting, pleasant and historic places, and having the most competitive prices and fees of the accommodation. It will also grant you a luxurious 5-star experience and services.The accommodation covers the sightseeing fees, all meals as per itinerary, and the transportation from Luxor airport to the cruise boat and from the city to Aswan airport as well. Kindly, note that the number of single rooms available is very limited. The policy of “First Paid, First Served” will be followed! Note: Upgrading from a double room to a single room is only possible if you pay the price difference. Luxor: the beginning of the conference, will take place 670 kilometers away from the city of Cairo, the conference will be on the Nile cruiser starting from the city of Luxor down to Aswan, which will take 5 days to get there. For participants of the conference from outside of Egypt. Upon arrival at the Cairo International Airport, you must travel to the city of Luxor by domestic flights, the duration of the trip will be about 1:15 hours . there will be a plane scheduled to depart almost every hour to arrive at Luxor. Upon arrival at the airport in Luxor, you must rent a taxi to the Embarkation of the Nile Cruise. Taxi costs about 2 euros, and will arrive within 20 minutes. If you prefer to travel by train: You have to go to the railway station by Taxi and it’s about 19 km from the airport in Cairo, and then travel by sleeping accommodation train to the city of Luxor and the trip will take 9 to 10 hours, and the cost of the trip is about 50 euros,The trip Ticket to Luxor and will be ending at Aswan. If you choose to travel by bus, you must also go to down town and you can find the bus station booking booth near the railway station, its about 20 km from the airport in Cairo. The journey to the city of Luxor by bus will take about 8 to 9 hours, and the cost of the trip is about 10 euros one way ticket only to the city of Luxor, after you reach the end of the bus station, you must rent a taxi to Embarkation of Nile cruise, the cost of a taxi about 2 euros, and will arrive within 15 minute. As for the participants in the conference from Egypt, if you’re a resident in Cairo, you’ll need to travel by bus or by sleeping accommodation train or the Spanish train, and if you are from outside the city of Cairo, you must travel by bus or by Express train via Cairo then you can change the train and complete your trip by sleeping accommodation train. – Every research paper should have at least a main author who should pay the full fees, even if the main author is a Master’s or a Ph.D. candidate. These fees include the attendance of only one author to the conference. – In case there is a co-author who is either a student or professor and wants to attend the conference and participate in its activities, he or she has to pay the specified fees. – In case students or interested audience want to attend the conference without presenting a paper, they pay the specified fees. – Attempting to pay before the 6th of November 2017 allowed authors to pay the authors fees ($300) instead of ($400). – A discount for the author fees was granted to those who paid the paper fees before the 6th of November 2017 allowing the authors to pay for the authors’ fees ($300) instead of ($400). – Attempting to pay before the 6th of November 2017 allowed authors to pay the authors fees (EGP 2200) instead of (EGP 2500). – A discount for the author fees was granted to those who paid the paper fees before the 6th of November 2017 allowing the authors to pay for the authors’ fees (EGP 2200) instead of (EGP 2500). Meet Professor Nabil Khélifi, Senior Publishing Editor of Springer, the publishing manager of the Middle East & North Africa Program. Professor Khélifi will moderate and hold a special session at the International Conference on Conservation of Architectural Heritage (CAH) 05 – 08 February 2018, including a lecture on publishing ethics and a roundtable discussion between all keynote speakers and those interested. 50 USD for non-participants (excluding the accommodation fees). An Egyptian Archaeologist who is known for her notable work in the field of Archeology, in the practical aspects and theoretical aspects as well. She has also played a huge role in the success of the first edition of the CAH conference. The 2rd Conference on “Conservation of Architectural Heritage” (CAH), to be held in Aswan City, Egypt, follows the success of previous meetings which launched in this amazing historical context in November 2015, and the one to be held in February 2018. IEREK carries this responsibility to address the complex challenge of conserving architectural heritage through this conference and plays its role to increase the awareness of how citizens should value and save our heritage. This conference helps universities researchers, professionals, and policy makers to get together to discuss the most pressing issues concerning the conservation of archaeological, architectural, and urban landscapes, and to discuss multi-disciplinary researchers on complex Cultural Heritage sites. Expected results and recommendations include a better understanding of the problems facing architectural heritage, the development of policies favoring its conservation, the definition of practical guidelines and the organization of training and awareness activities.